I started cleaning out a filing cabinet and am in awe of my former organized pack-rat ways. My mind has never been a steel-trap for memories, so I guess that’s why I saved the purchase receipts of the cars we’ve owned. They were even filed chronologically, starting with Jim’s first car. 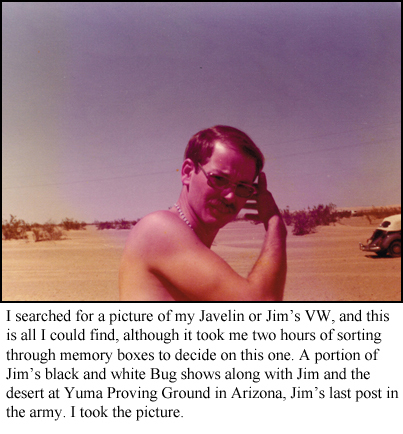 The 1963 Volkswagen bug, a black and white convertible, was a used car when Jim’s folks bought it in 1966. Jim had been on foot his freshman year at the University of Arkansas, and it’s hard to go out much when you walk everywhere. He decided he’d lay out his sophomore year and work until he earned enough for a car, but his folks thought he’d better stay in school. Cost of that Bug, which he drove for years, was $1000. Next in the folder was the receipt for my loan from the bank for my first car. I was afoot until I got out of graduate school. Well, not exactly. For two years I drove my folks’ car to Crowder College while I lived at home. When I lived in the dorm at PSU, I was on campus. In grad school, the walk from my apartment to the University of Arkansas campus was under a mile, and the grocery store was even closer, but my roommate, Sharil, and I learned quickly not to buy heavy objects like tomato juice since we carried everything we bought. By Thanksgiving of that first year in Fayetteville, Sharil got a used car, a VW Bug, so grocery shopping was easier, but still I walked to school. I’ll admit I took advantage of her, since she picked me up at 11:00 at night when I got off work at the university library. When Jim returned from the army, he bought a new 1975 GMC pickup for $2100. We kept that truck for over 25 years. The first car Jim and I bought as a married couple was brand new, a 1977 Lincoln Monarch, and we saved money until we could pay cash, $4,381. Ride-engineered, the sticker read, and we were impressed. So when did car prices go sky high? We went from plain-Jane models to cars with automatic windows instead of crank ones. I now drive a hybrid that has Bluetooth so I listen to books from my phone through the car radio. What a luxury. And of course I have that sticker and receipt in a file along with oil change receipts, and I have insurance papers on the car in yet another file. 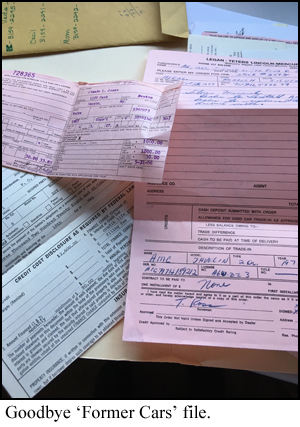 In my defense for this ‘former cars’ file, I should remind you that my degrees were in history, so I suppose I regarded the receipts as primary documents of my driving life. But I haven’t added to the file for decades, so it’s not a complete record. This file is going in the trash along with a lot of other detritus in that file cabinet. I need to look forward, not backward. If I keep looking over my shoulder, I can’t see where I’m going. And moving boldly into an unfamiliar future needs concentration and attention and focus. I don’t mean at all that I can forget my previous life or that I want to; I’m absolutely not deleting my personal history from my mind, but I feel lighter as I unload that file cabinet. I’m sure Jim would approve.